26 In the sixth month the angel Gabriel was sent by God to a town in Galilee called Nazareth, 27 to a virgin engaged to a man whose name was Joseph, of the house of David. The virgin’s name was Mary. 28 And he came to her and said, “Greetings, favored one! The Lord is with you.” 29 But she was much perplexed by his words and pondered what sort of greeting this might be. 30 The angel said to her, “Do not be afraid, Mary, for you have found favor with God. 31 And now, you will conceive in your womb and bear a son, and you will name him Jesus. 32 He will be great, and will be called the Son of the Most High, and the Lord God will give to him the throne of his ancestor David. 33 He will reign over the house of Jacob forever, and of his kingdom there will be no end.” 34 Mary said to the angel, “How can this be, since I am a virgin?” 35 The angel said to her, “The Holy Spirit will come upon you, and the power of the Most High will overshadow you; therefore the child to be born will be holy; he will be called Son of God. 36 And now, your relative Elizabeth in her old age has also conceived a son; and this is the sixth month for her who was said to be barren. 37 For nothing will be impossible with God.”38 Then Mary said, “Here am I, the servant of the Lord; let it be with me according to your word.” Then the angel departed from her. The way has been prepared. The pathway for the coming of God’s reign has been made straight. John the Baptist has taken up his calling, preaching the reign of God and inviting the community to come and be baptized as a sign of their repentance. John’s calling, as we are reminded throughout the season of Advent, is one of preparation. He is not the one we’re waiting for. He is instead the advance man. The Gospel of Luke begins with John’s story – the story of his miraculous birth to a woman who like Sarah and Hannah is barren. Elizabeth and Zechariah had long since given up hope of having children of their own, but then an angel of God appeared and surprised them with news that they would have the opportunity to have a child who will be dedicated to the work of God and prepare the way for the Lord (Luke 1:5-25). Having introduced John into the story (a person who figures greatly in the Advent journey, Luke invites us to consider the coming of the one whose way John will prepare. If John is not the one the people were waiting for, then who is it that we should be expecting? On this fourth Sunday of Advent, Luke makes that introduction. Once again we have an angelic visitation. The angel Gabriel, who had appeared to Zechariah, the father of John, now appears to a young woman living in Nazareth in Galilee. The angels come to inform her that she has found favor with God and that God has chosen her to be the vessel through which the coming one will be revealed. She has been chosen to bear the holy child, whose story Luke is about to tell. Now it is important to note Mary’s status. She lives in a small village in a region far from the center of Jewish life. She is not a person of wealth or status, and yet for some reason God has chosen her. She’s engaged to a man who, Luke tells us, is from the House of David. That is important, because the child whom Mary will be called upon to bear, will be called Son of David. He will be the one who restores the long since vacant throne of David, so that Israel, the realm of God might itself be restored. Yes, she has been chosen to bear the child, who will be great and will take up the throne of David, and will reign over Israel (the House of Jacob) forever. 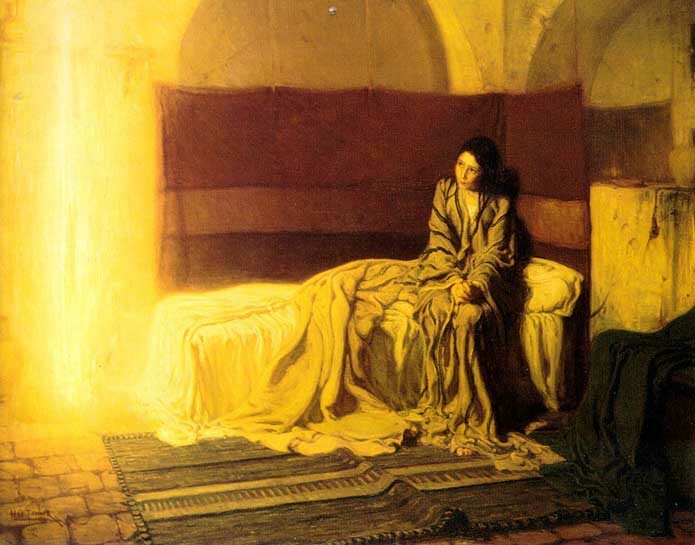 When Gabriel makes this revelation to Mary, she responds in a predictable fashion -- "how can this be?" Now her question isn't one of lineage -- Luke takes care of that question with a genealogy that takes Mary and Joseph back to David. It could have to do with her status as a virgin. For many this reference to Mary’s virginity is problematic. It leads to untold and unresolvable conversations about the possibility of a child being born to a virgin, and whether Luke (and Matthew) are borrowing from the myths of surrounding peoples, who told of the gods coming down to earth and impregnating human women, who bear children who are demi-gods like Hercules. But Luke doesn’t speak in those terms. He doesn’t speak of God having sexual relations with Mary. Rather the Holy Spirit, whom Luke lifts up as the power of God in the World, will overshadow her and in that mystery a child will be conceived. In other words, this is all a work of God shrouded in mystery. But perhaps her response is predicated on the question – why me? Who am I that you should choose me? That is a question we all should ask – why me? The answer is simply this – she (and we) have found favor with God. This conversation takes place in the sixth month after Elizabeth had conceived. According to Luke, Mary and Elizabeth are related (Luke 1:39-45) -- though their differing tribal status would seem to raise questions. Luke, however, isn't really concerned about those kinds of details. Instead he wants to connect these two figures in his story in a familial way. They are connected at their births and their stories will intersect in adulthood. One will prepare the way and one will be the way. Both figures emerge from what Luke describes as miraculous situations. Both are called by God to service, for which they have been specially prepared. As the Psalmist declared "for it was you who formed my inward parts; and knit me together in my mother's womb" (Psalm 139:13). The child whom Gabriel speaks of when he appears to Mary is called to restore the throne of David and then rule from it forever. This revelation is highly political, for the land in which Mary lives, is under the control of a foreign power that doesn’t take kindly to pretenders to the throne. Caesar determines who is to be king of the Jews, and at that time and place, the one who rules is Herod – a client of Caesar. Besides no one had sat upon the throne of David for more than six centuries. Yes, there was hope that someone would come into the world and turn things around, but would that person come from the womb of this young woman, likely a teenager, living in Nazareth of Galilee? Would her child be the one who would restore Israel? This is the message that Gabriel delivers to Mary – whatever the nature of this work of restoration she had the opportunity to participate in this work of God. She would be, as the ancient church declared, the theotokos ­– the God-bearer. I prefer this term to Mother of God, for Mary isn’t called upon to be God’s mother. Instead she is the one who bears the incarnate one, the one who reveals the fullness of God to the world (to borrow from John 1:1-14). Regarding the issue of the virginal conception (not virgin birth – no such thing), our decision about that matter will depend upon, as John Meier points out, on our philosophical and theological presuppositions (A Marginal Jew: Rethinking the Historical Jesus: The Roots of the Problem and the Person, Vol. 1, 222). Whatever our position, this text stands as signpost of God’s presence among us. It is a reminder that God breaks into our lives and creates new realities, which includes revealing the realm of God and inviting us to enter in to its confines. And none shall be afraid. (Chalice Hymnal, 132). Yes, there is no need for fear, for in the person of the incarnate one, God is with us!